The primary objective of the report card is to effectively communicate to the community scientifically sound and independent information at a relevant scale. If you have further questions, check out our Partnership or report card FAQ. The 2017 report card (reporting on data for the 2016/17 period) had no paper report card produced, to account for the earlier than usual release of the next version – the 2018 report card in mid-2019. This report card covers the 2016/17 period for environmental data, and repeats stewardship (industry best practice) data from the previous report card (2016/17) to allow the reporting years to align in the 2018 report card. You can view the 2016/17 report card data via our interactive results page. The Mackay-Whitsunday region was brutally impacted by Severe Tropical Cyclone Debbie when the Category 4 storm crossed the coast on 28 March 2017. The 2017 reporting period (July 2016 to June 2017) captures only three months of post-cyclone water quality condition. The 2018 report card will further reflect any impacts from TC Debbie. 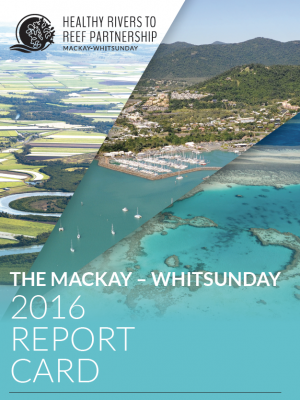 The 2017 report card year (July 2016 to June 2017) was wetter than the long-term average for the Mackay-Whitsunday Region and had the highest rainfall compared to all four previous reporting periods. Water quality in most estuaries, except for Sandy and Carmilla Creek estuaries, were in good condition, despite including the period when TC Debbie crossed the coast. Good water quality scores in the estuary systems suggest that water quality returned to pre-cyclone conditions soon after the event. The Region’s estuaries are short systems that experience large tidal ranges, so that following large rainfall events pollutants are normally flushed out of the estuaries rapidly. Four out of the five reported basins were in moderate condition, similar to the 2017 report card. The Don basin scored very good for pesticides. Offshore marine water quality was very good for the fourth report card in a row. The Pioneer basin dropped from a C grade to a D grade due to decreases in water quality from a combination of nutrients and pesticides. This basin covers areas of Mackay city extending to the west, including Fairleigh, Walkerston, Marian, Mirani, Gargett, Pinnacle, Finch Hatton and Netherdale. There was a drop in water quality grade in the O’Connell basin from good to moderate between the 2016 and 2017 report cards, which was driven by the pesticide indicator. The Plane basin (south of Mackay) is in a very poor condition for the fourth consecutive year. In the Whitsunday and Central inshore marine zones, there was a drop in overall condition from moderate to poor, driven by declines in water quality, seagrass and coral. It is possible that the water quality scores for the inshore marine zones underestimate the full impacts of Cyclone Debbie as turbidity loggers at some sites were lost or damaged due to the cyclone. Marine debris clean-up effort across the Region was reduced in the 2017 report card reporting period compared to the 2016 report card. The overwhelming majority of debris collected from the Region’s beaches is made up of plastics, with about half coming from the land around populated areas, and around half from the sea. On-ground observations and aerial imagery in the Region identify substantial changes to stream banks and in-stream morphology at certain locations due to Cyclone Debbie. Habitat and hydrology scores use repeated data from the 2014-2016 report cards, so do not reflect the potential impacts of Cyclone Debbie. These scores will be due to be updated in the net report card. New data not previously available reveals insight into the Don and Proserpine basins. 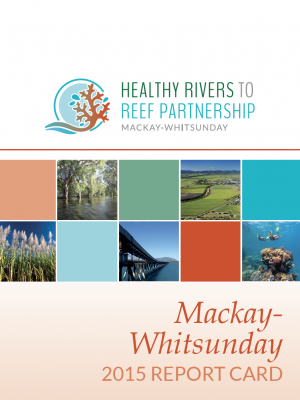 This is an important step towards filling data gaps and improving the understanding of water quality in the Mackay-Whitsunday Region. A monitoring program has now been funded and established for water quality, coral and seagrass in the southern inshore marine zone of the report card. The first scores for this zone will be water quality and released in the 2018 report card. Marine debris clean ups were reported in the Isaac Local Government Area (LGA) for the first time- on South Percy, Avoid Island and Digby Island. Most of the marine debris from these clean ups were plastic and were sourced from the sea. Adding to our knowledge demonstrates the Partnership’s commitment to improving the Region’s report card by filling data gaps and subsequently providing a better understanding of the ecological condition of the Region’s local ecosystems. The 2017 technical methods and results reports are also available to view. The 2016 report card represents the third annual waterway health report card for the region and covers the 2015/16 period for environmental data, and the 2016/17 period for stewardship (industry best practice). Click the report card cover to view/download the document. Rainfall is a key driver of water quality and two years of below average rainfall means scores for water quality in freshwater and estuaries are similar to the previous year, with pesticides remaining a key issue in the Pioneer and Plane basins. In the Whitsunday inshore marine zone, water quality scores from sampling at long-term monitoring sites decreased from moderate to poor. Research is currently underway to help us understand this situation. 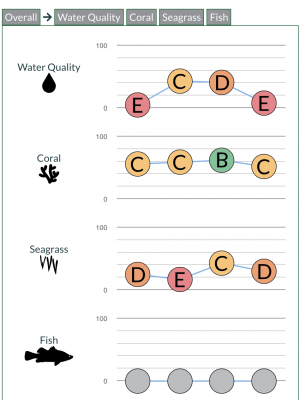 For the Whitsunday inshore marine zone the improvement from a D to a C score reflects only a marginal overall increase. This is because two out of three indicators improved, however the third has declined. Urban stewardship scores have improved from the last report card due to improvements in implementing the planning and management guidelines for urban development. You can also view our 2016 methods and results technical documents. The 2015 report card represented the Partnership’s first full waterway health report card for the Region. It covered the 2014/15 period for environmental data and the 2015/16 period for stewardship (industry best practice) and cultural heritage data. Since the release of the 2015 report card in October 2016, many improvements were made to methodologies and scoring of the report card’s environmental indicators. This has meant amendments to previously reported scores in the 2015 report card. These amendments allow for direct comparison of results between reporting years. These up-to-date scores can be viewed on our interactive results page. These improvements reflect the Partnership’s commitment to continued improvement and use of the most up-to-date science. Please contact the Partnership if you are interested in seeing the original 2015 report card and technical reports for our environmental indicators. You can still download our 2015 report card methods technical document for Stewardship and Cultural Heritage. What was new in the 2015 report card? New fish community health and fish-barrier indicators were added and provided an important gauge for native fish health and diversity. A newly developed flow indicator in the 2017 report card will complete the picture. Cutting edge new cultural indicators showed Cape Hillsborough and islands of the Whitsundays are home to some very important cultural heritage sites. Stewardship scores across all industries in the Region were similar to the previous year. The Pilot report card was released in 2015, and covered the 2013/14 period for environmental data, and the 2014/15 period for social, economic and stewardship (industry best practice) data. 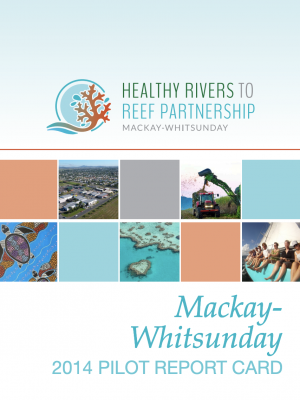 After the release of the Mackay-Whitsunday 2014 pilot report card in October 2015, many improvements were made to methodologies and scoring of the report card’s environmental indicators. This has meant amendments to previously reported scores in the 2014 pilot report card and the 2015 report card. These amendments allow for direct comparison of results between reporting years. These up-to-date scores can be viewed on our interactive results page. This reflects the Partnership’s commitment to continued improvement and use of the most up-to-date science. Please contact the Partnership if you are interested in seeing the original 2014 pilot report card and environmental indicators technical reports. You can still download the original 2014 pilot report card technical report documents for Stewardship and Social and Economics.